Do you see that beautiful baby girl above? She is saving lives as an angel. With the help of her brave Mama, Kristine, they are spreading awareness about CHD and having babies pulse oxygen levels tested at birth. I have written about Cora, and her mother has been my one and only guest blogger here with her poem to Cora during CHD awareness week. Today is Cora’s seven month birthday. This is the day that Cora’s Story asks people to wear pink and help to spread the word about CHD. I purposely kept the one and only pink shirt that I own for today. When the boys and I went to the park with Nana, I took my picture. My mother asked why and I responded – this one is for Cora. Sweet Cora, I read your Mama’s wishes the other day and had tears in my eyes. If only I could grant her wishes, especially the one that would bring you back. I do know that I am sending her something special in the mail. Some things to pamper herself and another item to help your charity. I know your family is helping to save other babies. Kristine, one of my wishes is to give you a great big hug in New York City in a little over a month at BlogHer. You my friend are a hero. Never forget that you are an absolutely amazing and brave Mom. 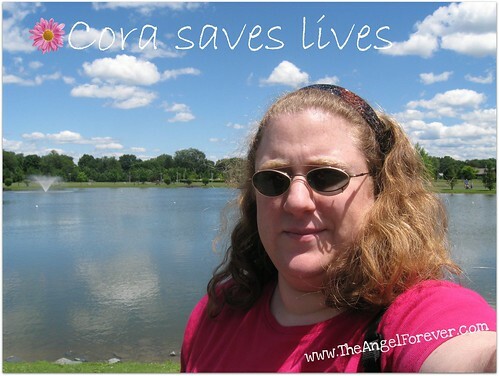 This post is absolutely beautiful…I read Cora’s story on facebook and cried …..
You do wonderful things with your blog…bringing her story to others….I will wear pink on the 30th of each month going forward for cora…. Aw. I am familiar with Cora’s story but didn’t realize she would have been 7 months old today. This is bittersweet for me because today is my baby’s first birthday. I can’t imagine what Kristine and her family have been through.